MAS Official: Bin Laden a "Visionary"
Updated May11: The Muslim American Society issued a statement retracting the comments detailed in the story below. The comments do "not represent in any way the position of the Muslim American Society and its leadership," the statement from MAS President Ahmed El Bendary said. "We are investigating the matter internally to prevent this from happening again. MAS apologizes to all for the confusion and aggravation this incident has caused." A leader of a major American Muslim organization, the Muslim American Society (MAS), is arguing that there "was nothing wrong with" Osama bin Laden's dream of creating a renewed Caliphate. Khalilah Sabra's comments are the most recent and worrisome from the group, which has a long history of defending alleged terrorists. Sabra, the director of the North Carolina branch of MAS' Freedom Foundation, made the statement in a sometimes disjointed article entitled "Agreeing to Disagree About the Death of Osama Bin Laden" that was released Wednesday under the MAS logo. The statement aligns more with a period of Sabra's life in the late 1980s, when she traveled to Afghanistan with bin Laden's predecessor, Abdullah Azzam, to provide aid to the mujahideen fighting the Soviet Union. Her statement doesn't defend bin Laden's terror attack on 9/11. But it does laud his vision of an Islamic state and his desire to "liberate" the Afghani people. "He was a visionary who believed in the possibility of an Islamic state in Afghanistan and the possibility that this thing might someday be," Sabra wrote. "There was nothing wrong with that dream, even if it differs from that one that all Americans have here for themselves." In 1997, bin Laden described his vision of a Muslim leader "who can unite them and establish the 'pious caliphate.' The pious caliphate will start from Afghanistan" and spread from there. Bin Laden "was not the same man who came to fight against the occupation" by the Russian army, she wrote, but still cast his example in positive terms: "With his wealth and ability, he could have done almost anything he wanted to do. At that time he supported the anti-occupation forces by providing housing for the thousands of volunteers who converged on the small border town on the edge of Pakistan. At that time, Osama Bin Laden cared unrelentingly about the Afghan Muslim children in the same way he cared about his own children, and believed in the right to liberate the Afghan people from their Russian aggressors, who raped innocent women and who tried to destroy the country in order to control a country they did not have rights over." Other MAS officials have expressed more supportive statements about bin Laden's death. "Bin Laden was not a Muslim leader; he was a mass murderer of Muslims," said MAS President Ahmad El Bendary. "Indeed, al Qaeda has slaughtered scores of Muslims in many countries, including our own. We concur with the president that his demise should be welcomed by all who believe in peace and human dignity." 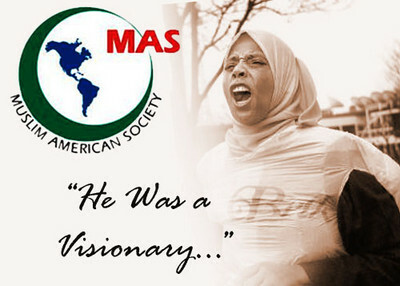 MAS was founded as an arm of the Muslim Brotherhood in the United States and has a record of supporting alleged terrorists and terror financiers. Three of its founders were listed in a telephone book of American Muslim Brotherhood leaders. Several Brotherhood leaders have denounced the U.S. raid killing bin Laden, referring to bin Laden with the honorary term "sheik," and defending "resistance" against American forces in Iraq and Afghanistan. Other MAS leaders have defended violence. The Investigative Project on Terrorism captured former President Esam Omeish on videotape at a 2000 rally praising Palestinians for knowing "the jihad way is the way to liberate your land." Similarly, the head of MAS's political wing, the MAS Freedom Foundation can be seen raising a fist in agreement at a separate 2000 rally in response to a call to show support for Hamas and Hizballah. In addition, Mahdi Bray traveled to Egypt in 2008 to attend a vigil in support of Brotherhood officials on trial. Bray and his organization have backed a series of alleged terrorists and terror financiers over the years. Among them, Abdurrahman Alamoudi, who pleaded guilty to illegal financial transactions with Libya and aiding a plot to assassinate a Saudi crown prince; and Sami Al-Arian, a member of the Palestinian Islamic Jihad's governing board. Both cases were dismissed by MAS as trumped-up cases of anti-Muslim bias by the government. Sabra exhibited that reflexive response following the 2009 indictment of North Carolina Muslim convert Daniel Patrick Boyd and six other men. Boyd was accused of being leader the group – which included two of his sons – in a desire to wage jihad against American soldiers abroad and talked of striking targets in America when their original plan failed to materialize. Though officials had an insider and recordings, Sabra cast the case as "an illusion. Either the defendants have created an illusion, or the agents have created an illusion, but the reality has yet to be seen." In February, Boyd pleaded guilty to conspiracy to provide material support to terrorists and conspiracy to murder, kidnap, maim, and injure persons in a foreign country. Sabra has said she met Boyd in Afghanistan 20 years earlier, during the fight against the Russians. That's when bin Laden attracted the "thousands of volunteers" Sabra mentions in her article. They became the core of al-Qaida and the leadership of terrorist organizations around the world. Sabra's connection to these volunteering mujahideen, or holy warriors, dates back to her own experiences working for bin Laden's predecessor, jihadist ideologue Abdullah Yusuf Azzam. impressed and eventually agreed to go with him to Afghanistan," the article said. "For about a year, Sabra lived in Peshawar, Pakistan, and made regular trips to nearby Afghan refugee camps." Azzam is considered a founding father both of Hamas and of al-Qaida. The Gulf Times article describes him as "the godfather of jihad." In her article, Sabra lamented the price Muslims have paid for bin Laden's terror, including a rise in anti-Muslim sentiment, the Patriot Act and the creation of the Department of Homeland Security. "Osama Bin Laden singlehandedly undid some of the most significant Islamic work done in America," she wrote, "and disseminated the rights of Muslims here and forced the world to ignore the rights of our other brothers and sisters on the other side of the world. He knew there was a price to pay for his actions and ideas. He paid. I do not believe that any human being relished the terror and the loss of blood that came with his death, but most believe he would not have wanted to be arrested, brought to America and tried in our courts of law. In the end, he died on his own terms." Let's agree to disagree about the death of bin Laden??!??! That is exactly what is wrong with the naive mentality of multiculturalism in the West. If a nazi was openly espousing nazism in America after Hitler died, would we 'agree to disagree' about it? When will people wake up to the fact that Islam is a totalitarian ideology that demands submission, not a religion like Christianity or Judaism or Hinduism to be tolerated. Islam does not coexist peacefully, Islam dominates. Read the Koran, read the Hadiths. Get a translation as close to classic Arabic as possible, as some of the translations are slightly altered and sugar-coated to appear more benign (this is called Taqiyya, the Muslim practice of lying to the masses to advance the goals of Islam). Really an action of the minority? Is radical Islam really an act of the minority? Historically, Islam has principally spread by the force of the sword. All the way to India, which had no quarrel with any of the Arabic tribes. This is waaaay before even Pakistan was thought of, so no Kashmir excuses please. Even though there is clear proof that some of the Mosques in India, are built on destroyed temples, there is no mass movement among Muslims that they should be returned back to their original religion. And yet it is supposed to be said in Koran that desecration of other religious houses is not permitted. Even the equally vile Roman Catholic church finally had dissenters who helped the silent majority break away. So when will the muslim majority break free? Citizens who react the way you have expressed in your comment. chose to do so because like you, we too are victims of radicalism. However, you condemn others for reacting the way humans do in the face of radical Islamic Imposition and terrorist fear. They did not choose to be apprehensive of, be proccupied with and make concessions for an evident Islamic agenda. It was thrust upon them by terrorist actions in corroboration with Jihadist doctrine in the Koran. What would you have them do, ignore the suffering, ignore the Koran, ignore the truth and not react accordingly ? Like you, I too am sorry that the reaction is the way it is. What is an unfortunate truth is that radical Islam in accordance with the Koran has made it impossible to determine who and when, one is telling the truth. The truth is that Usama Bin Laden died because he killed 3,000 innocent men women and children period You asked for respectful dialoque and truth, however your comments lack what you made a point, to ask for..
Every human being has a vision. Some become completely distorted and lead to acts of madness, it's unfortunate but it happens. The sickness sinks in and perverted impulses clouds what should be naturally sane. This was the case with Osama Bin Laden. My vision is different and it is the only one for which I am accountable. My vision has evolved from the democracy for which I was born into. It allows for you to practice your faith and for me to practice mine. I have no wish to impose my beliefs on anyone else and want nothing more than mutual respect. I believe that my United States Constitution allows for that and I do not seek to replace it with any other political ideology or any other religious laws. As a citizen of this country, I pledge my allegiance to abide by the rules of this country. For those who are incline to follow another form of government, they always have the option of leaving, regardless of their faith. Any Muslim who commits a crime should be subjected to the penalties established by the laws of this land. It is, however, his or her right to be tried and if convicted, suffer the consequences. Contrary to endless stereotypes, the real practitioners of Islam want very much too see human beings linked to one another. Why do you insist to judge the majority for the actions of a minority? We all owe our existence to the knowledge,technique and the efforts of those who have gone before us. They came from many religions and wore different shades of color. Some were Muslim, some Jewish and some Christian, yet every group has their share of evil. As much as I hate evil, I respect the American court system's administration of justice. You cannot claim to know mw more than I know myself and I readily admit my beliefs. People like Pamela Gellar and Steve Emerson seem to be able to gather quite an audience so why not use it for the good? Despite the misery and suffering so many have felt the last ten years, there is a light at the end of the tunnel. Walk towards the light! Tolerance and respectful dialogue undoubtedly requires courage. Why not exercise some and stop judging others by superstitions and untruths. I have worked in refugee camps assisting women traumatized by war. I worked with a group that took food to orphans. I have never turned a weapon on any man and it is not in my nature to do so. When will people learn, America will achieve a healthy sense of democratic identity, only when people abandon racism and religious bigotry. When you seek to paint a person by telling lies and creating hatred, you are the one who, psychologically, has stepped away from all things relating to American democracy and justice. Why would you choose to cause hurt and harm when you have the stage to do good? Why would one man or woman work so passionately to make one group of people hate another. This is what led Bin Laden to his fate. it is what destroyed him. It will not benefit you, anymore than it did him. His and your actions are motivated by raw self-interest. Shame on you all. You are as callous as you accuse others of being. You and I agree, Muslim community efforts to quash radicalism must go beyond mere talk. There must be continued efforts made through community policing and cooperation with law enforcement. It serves no purpose to scoff at people who are well-intentioned and trying to make a difference. By the way, I never defended Boyd, I defended his right to due process- nothing more and nothing less, nor did I ever mention a "Caliphate" anywhere or at anytime. The worst lie is the one with half-truths and bad intentions. it serves no purpose. It does not educate, but only empowers ignorance and fear. If a man wants to be considered an expert in his field, let him try to be as accurate as possible or he should resist making such a claim.